This 4R approved Agronomist Handbook is intended for you and your customers to improve awareness of products and services that can reduce phosphorus, agrichemical and soil movement from fields. Resources in this handbook were developed by the IPM Institute of North America, the National Center for Water Quality Research and the Natural Resource Conservation Service, with financial support from the Great Lakes Protection Fund and the National Fish and Wildlife Foundation. 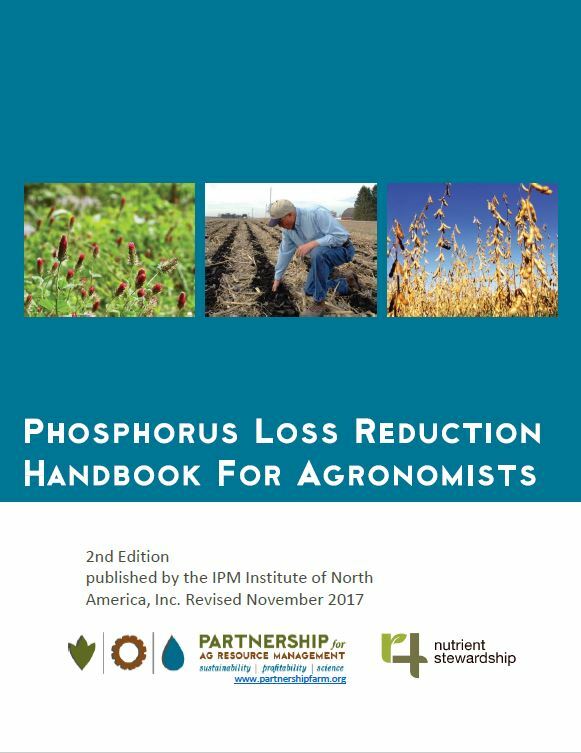 Within this handbook you will find reference and marketing factsheets for products and services, the P-Loss Reduction Wallet Card and order form and an NRCS-approved sample Nutrient Management Conservation Activity Plan (CAP 104). We have also included results from an annual survey of ag retailers in the Sandusky River Watershed, which tracks adoption of products and services that reduce phosphorus losses over time. The Key Facts for Farmers are intended for you to share with your customers and include a fillable footer area for your contact information. These marketing sheets contain information on variable rate technology, strip tillage and cover crops, which are opportunities for you to increase sales and revenue, and reduce P losses and improve water quality. Providing these products and services will help you build your one-stop-shop to retain customers and get the most out of your current equipment and technology. Identifying P-Loss Hotspots is designed to help you and your customers identify and correct issues that can cause P losses, and also lead to expensive equipment repairs and downtime. The Sample Conservation Activity Plan (CAP) 104 illustrates information included in a NRCS-approved nutrient management plan.